Come join us on this epic journey through the twisty back roads of Eastern Arizona, where you can take-in the beautiful scenery and enjoy your BMW in a manner that brings out its legendary BMW engineering magic. U.S. Route 666 was first commissioned in 1926, with a northern terminus of Cortez, CO. The Signage arrived to Arizona in 1938, stretching to Douglas, of which 30 miles of it overlapped U.S. Route 66. 1985 marked the end of U.S. Route 66 designation, leaving U.S. Route 666 an orphan. Due to dislike of the reference to the Antichrist, street signs were stolen at a faster pace than they could be replaced. Rerouting and complaints from superstitious drivers were a few of the reasons that lead to the gradual cessation of Route 666. Eventually, Arizona changed the numbering to U.S. 191 in 1993. 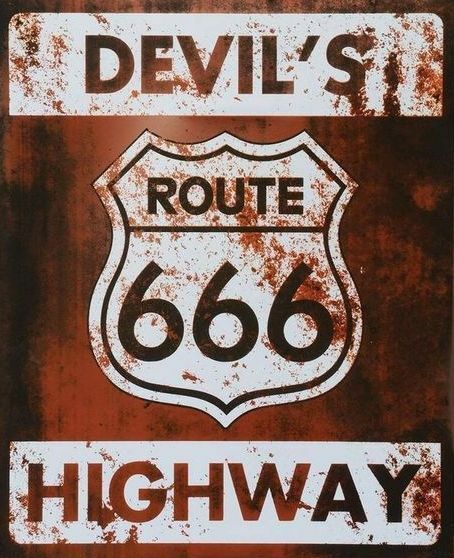 On May 31, 2003, U.S. Route 666 officially became extinct, leaving legends, scenic miles, and the nickname “The Devil’s Highway” for posterity. The “Loop” will start in Alpine and wind its way east into New Mexico (Hwy 180). 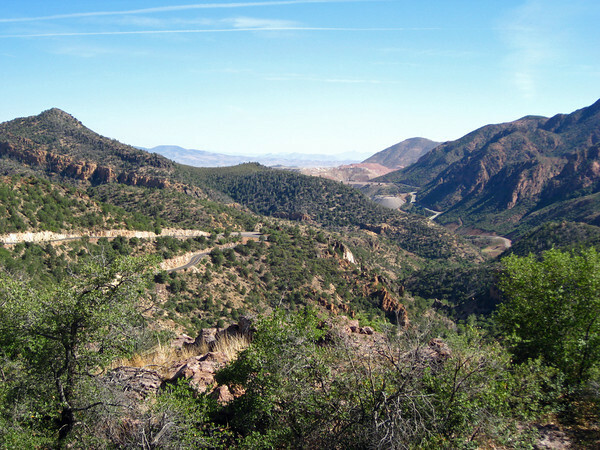 From there, we will hook down and around to Clifton, Arizona (Hwy 78) and then back up to Alpine, Arizona (Hwy 191). The total distance is about 220 miles of spectacular views, mountain vistas, high mountain meadows, and enough twists, curves, and long-fast sweepers through multiple elevation changes to make you and your BMW happy for many months to come! The plan is to make the loop once on Saturday. Departure will be on Saturday morning, at about 10:00am, from the Tal-Wi-Wi Lodge. We will stop for lunch in the Clifton / Morenci area around 12:30pm or 1:00pm. Once we are all fed and rested, we will get back to it and continue the route back up to Alpine on the deliciously twisty portion of Highway 191. Last year, we stopped at Michelle’s in Morenci. Michelle took very good care of us, so we will likely stop at her place again for a nice lunch before the best part of the drive back to Alpine, The Devil’s Highway! Once we return to the lodge, you will have the opportunity to recap your extraordinary adventure with other BMW enthusiasts, over a delicious meal, at the Tal-Wi-Wi Restaurant. Please RSVP below and be sure to include first names for all attendees so we can prepare name tags. Wait a minute after clicking on the Confirm RSVP button to allow the system time to process your request. You will be taken to a confirmation page. Update on March 18th: Some members have had difficulty getting a response from the Lodge staff. If you have received no response to an email or a voice-mail message, try calling one of these numbers until you are able to speak to a staff member. This is especially important because they will not hold any rooms beyond May 1st. We have secured the entire block of rooms at the lodge and have made them available to our members on a first-come first-served basis. As usual, the rooms will fill-up quickly. The Tal-Wi-Wi Lodge has been recently renovated; the new Clubhouse and Restaurant are fantastic and, over the winter, additional guest rooms have been updated. Cancellations must be received 72 hours prior to check-in or one night will be charged against your deposit. The room block will be held until 5/1/19, at which point, any remaining rooms will be released to the general public. We will stop for lunch in Payson. Do you love driving, socializing, and great food? 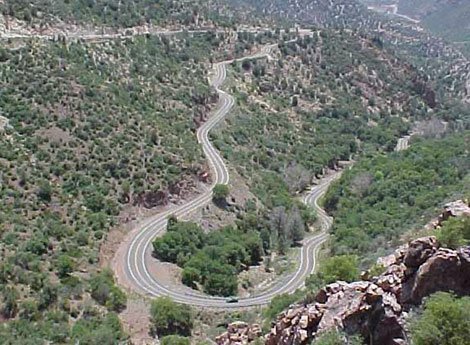 Then come join us for a group drive through the Copper Corridor Loop and then a break for lunch at the Copper Bistro in Globe, AZ. The restaurant is on the way in to town. The group will depart, caravan style, promptly at 9:30am and head over through the Copper Corridor Loop via AZ-177 with a stop in Winkelman, AZ for fuel and restroom break at the Shell station where AZ-177 and AZ-77 meet. We will make an additional stop at Pinal Pass for photos. There will be a drive leader, as well as a secondary group coordinator, to keep the group together and help ensure safe travels for our members and the general public. Please RSVP no later than May 2nd below in order to reserve your spot for the drive and be sure to include first names for all attendees so we can prepare name tags. Wait a minute after clicking once on the Confirm RSVP button to allow the system time to process your request – you will be transferred to a new web page. Come one, come all, to the largest annual mountain BMW gathering in the Rocky Mountain Region! The intent is to create an event that cultivates a community of BMW owners in the Rocky Mountain region and beyond; a place for enthusiasts to gain a sense of community that celebrates our cars just as much as it celebrates those who own them. If you’re looking for a way to beat the heat in Arizona, this summer, and need an excuse for a weekend getaway then look no further. BMW CCA members and non-members are welcome, and come from all over the Southwest. We are planning to arrange a caravan, for those that will be driving up from Arizona. Details on the caravan will be forwarded to those that register and RSVP below. View additional details and REGISTER NOW to reserve your spot! Do you love driving, socializing, and Italian food? Well, then this is the event for you! Come join us for a group drive up to beautiful Payson, Arizona for lunch at Cardo’s Pizza and Italian Restaurant, where they are known for their out of this world Crispy Chicken Parmesan. The group will depart, caravan style, promptly at 9:00am and head up to Payson via AZ-87 N. There will be a drive leader, as well as a secondary group coordinator, to keep the group together and help ensure safe travels for our members and the general public. Please RSVP to Barbara Micheletti via email HERE, no later than January 27th, in order to reserve your spot for the drive.